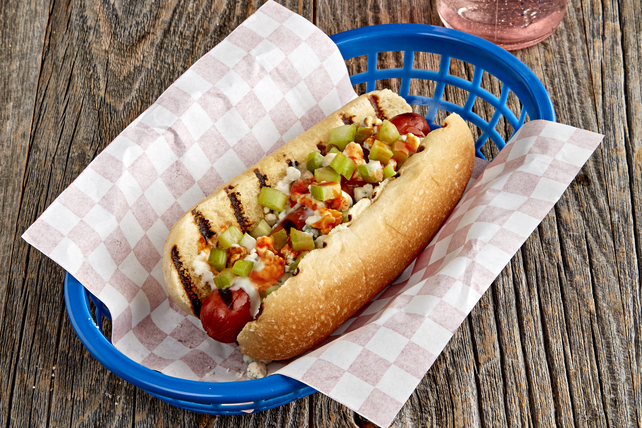 These grilled hot dogs have all the flavour of buffalo chicken wings - including the blue cheese and celery! Grill hot dogs 7 min. or until heated through, turning occasionally and adding buns, cut sides down, to barbecue to toast for the last minute. Place hot dogs in buns. Prepare using whole wheat hot dog buns and Kraft Calorie-Wise Rancher's Choice Dressing.